Best Ever Glazed Carrots have the most amazing brown sugar glaze and caramelize as they roast! 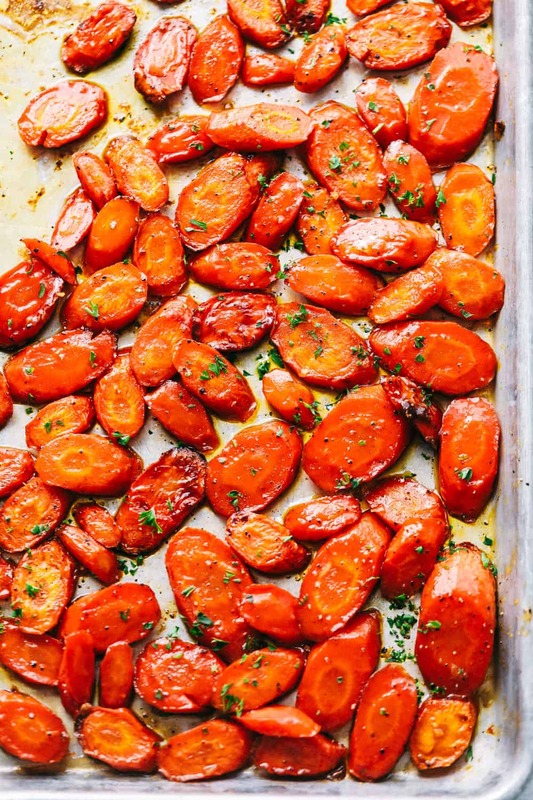 These carrots are so irresistible and are going to be the star of the table! We love carrots as a side dish and just to enjoy as a snack. These have always been a favorite in our home. Roasted Brown Butter Honey Garlic Carrots, Honey Orange Glazed Carrots or Garlic Butter Parmesan Carrots are more delicious carrot recipes that are a must try too. Carrots are a staple in our home! We love to dip, snack and add carrots to most our meals each night. We love carrots! Any time I have the opportunity to add a side dish it is most likely carrots in our house. I love how easy these Glazed Carrots are to make and the flavor is SO rich! It really adds to a table top of food. I love that my kids have enjoyed vegetables paired with their meals as they grow up. It does help to add a little brown sugar ;). With spring and summer coming up I love especially love the bright orange color that carrots bring to the table. These carrots are tender and full or flavor. My kids usually eat the carrots first before starting in on the rest of the meal. It is their favorite part! These Glazed Carrots are a simple side dish that is easy to please everyone around your table. Preheat oven to 400 degrees and spray a baking sheet with non stick cooking spray. In a medium sized bowl, add the carrots, olive oil, butter, brown sugar, garlic, and salt and pepper and combine. Spread the carrots in an even layer on the cookie sheet. Roast for 10 minutes and toss. Then roast for another 10 minutes until the carrots are tender and caramelized. Garnish with fresh parsley if desired. 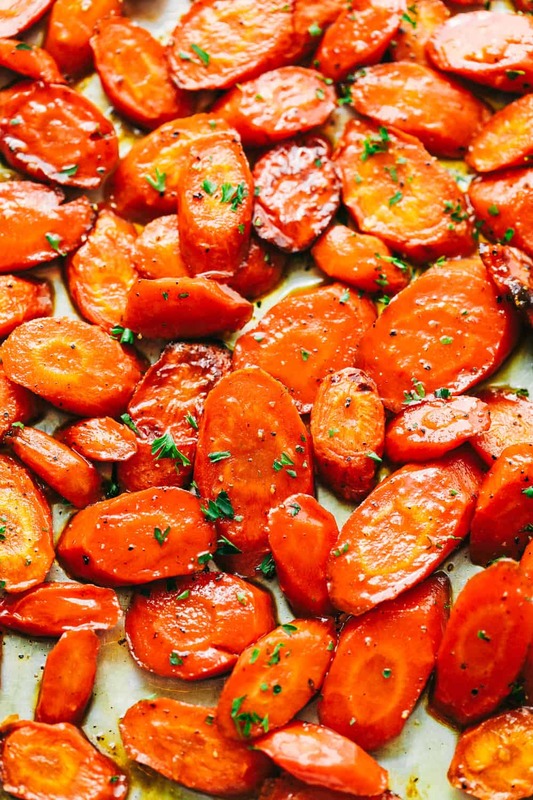 Can You Cook Glazed Carrots in a Slow Cooker? Yes! You will prepare them the same then add them to the slow cooker to cook on low for 4 to 6 hours or until tender. Can You Add Any Nuts to Glazed Carrots? Glazed Carrots are delicious without anything extra but if you are looking for a crunchy, nutty flavor to add these nuts are a great and subtle hint and bake well. Can You Cut and Prepare the Carrots Ahead of Time? Yes! 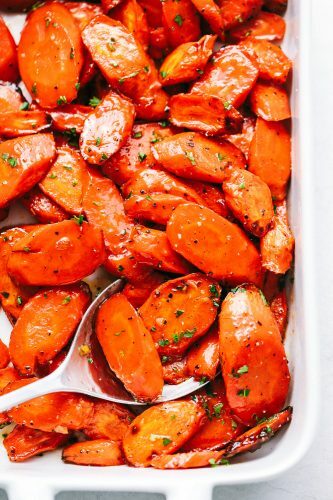 You can cut and prepare your carrots up to 3 days before you plan to make this side dish. I recommend making them fresh but understand if you need to peel and slice them store them in an air tight container in the refrigerator then continue to follow the recipe as directed. Do You Cut All the Carrots the Same Thickness? Yes! You will want to cut them the same thickness so they cook evenly on the cookie sheet. What Can I Substitute the Brown Sugar with? Looking For More Side Dishes? Here are some to try!